Today I'm going to be showing you what I think is my best design thus far for the challenge. The theme is Inspired by a Book, and I knew exactly which book to choose! My favorite author is Ellen Hopkins so of course I had to do one of her books. I even have an autographed book from her! Coincidentally, her latest one just released 2 weeks ago on my birthday! I haven't had time to go buy it yet, but I did these nails inspired by the cover art! I couldn't stop staring at them. They were so fast and easy and so visually pleasing! For the coloring I used L.A. Colors Color Craze in Static Electricity & Nuclear Energy, plus elf Dark Navy & Dark Glitter Purple. To create the messy watercolor look, I first mixed small amounts of the L.A. Colors polishes with clear polish on some paper. Using a dry brush I smeared some messily onto my nails. This made the polish really thin and give it just a hint of color. Then, again with a dry brush, I smeared on some of the deeper elf colors and just quickly brushed them on to make them messy and splatter-ish. Sadly, I did these nails and had to take them off 10 minutes later because they weren't an appropriate mani for where I had to go that day. Boo hoo. I need to do this again and be able to appreciate the mani for more than 10 minutes! What do you guys think? Did I capture the book cover well? Would you wear this grungey look? These look SO great! 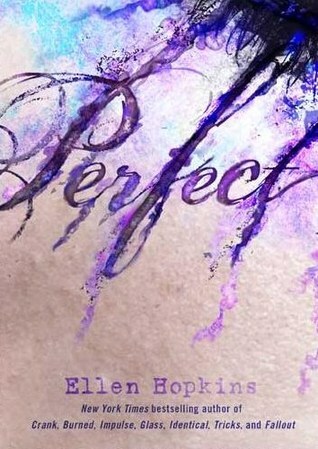 I love the colors and it looks just like the book cover! Came out amazing, it matches the book cover so well!! Oh I love this! Such a nice design. Reminds me of an Impressionist painting! I would absolutely wear this! Awesome! Stunning. Absolutely gorgeous - you have the cover exactly. Also I think you just sold me Skull and Glossbones. I haven't got to read that book yet, I've read some of her others. I love your nails here, they're gorgeous! It looks exactly like the book cover! Great job! Cool! Represents the book very well! Really lovely! The colors are gorgeous together. You did a great job of capturing the feel of the cover art. this is a spit image of the book cover! great job! I love your interp. of the book cover- and it's still fashion forward, I'd wear it. just started following you and just started my 30 day nail challenge yesterday! good job! Beautiful! I've never read any of her books, I'll have to go check them out! Ellen Hopkins put this on her facebook! oh my GOSH birthday giveaway winner!! it's my birthday! my giveaway is closed! "how did you do that?!"